There is no White House Council of Sociology Advisers, or Council of Political Science Advisers, or Council of History Advisers. But since President Harry Truman signed the Employment Act of 1946 into law, for the last 70 years there has been a Council of Economic Advisers. The current CEA takes a look at its own history in Chapter 7 of its just-released 2016 Economic Report of the President. The chapter includes a dose of detailed history of the CEA, and mini-essays from a number of those who have served as CEA chairs. Here, I'll focus on three themes: What makes the CEA distinctive as an organization? What are its tasks and some of the big policy choices it has championed? And is it important, in substantial part, for its role as an institutional skeptic? CEA is in many ways a distinctive institution, both within the administration and in the international context. The CEA chair reports directly to the President on economic issues, but CEA has no regulatory authority and few prescribed operational responsibilities. For most of its history, CEA has had a small staff drawn mostly from the academic economics community and hired on the basis of professional expertise. ...Because CEA has no fixed statutory responsibilities except for assisting in the preparation of the annual Economic Report of the President, its role and influence depend on the degree to which it can be useful and relevant to the President and other senior decision makers. ... Today, CEA’s staff is composed of academic economists and economics graduate students who are on leave from their university positions, career government economists on temporary assignment from other agencies, some recent college graduates who have studied economics, and a small statistical, forecasting, and administrative staff. "Joseph Stiglitz argues that the fact that CEA is composed of “citizen-bureaucrats” who know they will be returning to their academic perches shortly means that they “have a long-term incentive to maintain [their] professional reputations” (1997), and that this creates an incentive for CEA staff to ensure that its recommendations are economically defensible. ... CEA’s academic character also helps to bring fresh perspectives on policy into the government, both by bringing in new people who have new ideas, and through keeping open the channels of communication with academia. It also means that CEA’s views about policy tend to reflect economists’ current understanding of how best to promote the public interest." Thus, even though members of the CEA are chosen and appointed by the White House, and are often either ideologically sympathetic to the president--or at least not oppositional--they are not locked into the same incentives as those who expect to be long-term Washington insiders. For example, the Burns Council supported the Federal Aid Highway Act of 1954, which began the present Interstate Highway System. The Heller Council under Presidents Kennedy and Johnson was especially prolific, “helping to shape transportation and trade bills, aiding in the development of the monetary ‘twist’ policy, helping to keep mortgage rates down, [and] developing the rationale of the wage-price guideposts” (Flash 1965). It also helped to develop the idea of the War on Poverty. ... .. Former CEA Chairman Joseph Stiglitz enumerates a number of specific “narrow microeconomic initiatives” in which CEA has played an important role, such as designing tradable permits in pollutants, incorporating risk and discounting into cost-benefit analysis, and introducing auction mechanisms (1997). During negotiations over the Clean Air Act Amendments of 1990, CEA was viewed as the “repository of neutral competence” and was called on to produce unbiased cost estimates of a range of different provisions (Porter 1997)." "Economics is a highly sophisticated field of thought that is superb at explaining to policymakers precisely why the choices they made in the past were wrong. About the future, not so much. However, careful economic analysis does have one important benefit, which is that it can help kill ideas that are completely logically inconsistent or wildly at variance with the data. This insight covers at least 90 percent of proposed economic policies." "For instance, the Heller Council argued against a proposal during the Kennedy Administration to use nuclear explosives to widen the Panama Canal. In the Nixon Administration, CEA played a leading role in the analysis that led to the conclusion that the government should not subsidize the development of a supersonic transport or SST plane, dubbed the “sure-to-be-subsidized transport” (Schultze 1996). Under President Ronald Reagan, CEA participated in a Gold Commission, which investigated the feasibility of returning to the gold standard, and ultimately advised against doing so." "But we also did a lot to stop bad ideas and in collaboration with many allies across government, we succeeded in many arenas. We forged an alliance with the Antitrust Division of the Department of Justice to block a proposal to sustain the price of aluminum through the creation of a global aluminum cartel. We helped overcome legislative attempts to change the mandate of the Federal Reserve to focus only on inflation and not on unemployment, and helped defeat a constitutional amendment to require a balanced budget." When you read a CEA report, there is always a certain admixture of politics, and at some points over the roughly 40 years I've been reading these resorts, the partisanship has been severe enough to make me wince. But it's also true that one can read just about any report looking for ways to discredit it. My own approach is instead to search for nuggets of fact and insight, and over the years, CEA reports have typically offered plenty. Similarly, one can look at shortcomings of the CEA, like a degree of politicization, as a reason that it should be disregarded or even discarded. But that would be an egregious overreaction. The government might benefit from more short-term advisory roles designed for mid-career professionals, who will bring their expertise that cannot be dismissed on partisan grounds for a time--while planning to exit Washington and return to a non-government life. Also, this CEA chapter discusses at some length the conflict between CEA’s first chairman, Edwin G. Nourse, and its second, Leon H. Keyserling, The Fall 1997 issue of JEP included an article W. Robert Brazelton about Leon Keyserling, who was involved in the passage of the Employment Act of 1946, was one of the original members of the CEA, and then succeeded Nourse to become the second chairman of the CEA. If you, like me, have a purely academic fascination with billionaires, check out "The Origins of the Superrich: The Billionaire Characteristics Database," by Caroline Freund and Sarah Oliver, published by the Peterson Institute for International Economics (February 2016, WP 16-1). The data show three interesting trends. First, extreme wealth is growing significantly faster in emerging markets than in advanced countries. The rise of emerging-market wealth is the subject of our book using this dataset, Rich People Poor Countries: Th e Rise of Emerging-Market Tycoons and their Mega Firms (Freund 2016). The book shows that there has been a sharp increase in billionaires from emerging markets over the past 20 years, a large and growing share of whom are company founders, creating new and innovative products. Th e emerging-market superrich are no longer concentrated in the resource and politically-connected sectors of the past. Second, wealth is increasingly self-made, even in the advanced countries. The relatively rapid growth in the number of self-made billionaires and their wealth alleviates some concerns raised by the economist Thomas Piketty about returns to capital growing faster than income, which would cause fortunes to become more concentrated over time if capital remained in the same hands. In fact, extreme wealth is created and destroyed at a nearly constant rate in the United States, such that the median age of the businesses behind American fortunes is about the same now as in 2001. There is somewhat less dynamism in the other advanced economies, especially Europe, where fortunes are older and aging over time. Finally, there are marked differences across regions and countries, even within income groups, which offer information about the climate for big business. Among emerging markets, East Asia is home to the large-scale entrepreneur. In contrast, the Middle East and North Africa is the only region where the share of inherited wealth is growing and the share of company founders is falling. Other emerging-market regions fall somewhere in between. ... In Europe, inherited wealth still makes up the majority of billionaire wealth, while the growth in US billionaires has been driven by self-made wealth. Here's an illustrative figure showing the source of billionaire-level wealth. 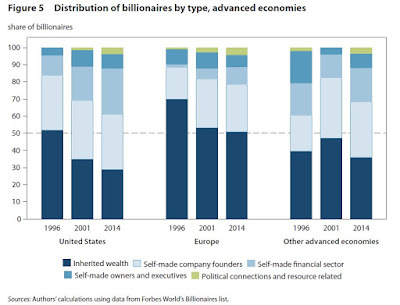 In the US, the share of billionaires who inherited their wealth (darkest blue part of the bar) has fallen since 1996, while the share of those attaining billionaire wealth as "self-made company founders" and "self-made financial sector" have risen substantially. In that latter category, the more detailed US data shows an especially large rise in hedge-fund billionaires. In Europe, a large share of the growth of billionaires has been in "traded sectors" of the economy, while in emerging markets, most of the growth of billionaires has been in "new sectors" and "nontraded sectors." Those who are interested in a more systematic exposition about wealth inequality at all levels might begin with "Piketty and Wealth Inequality" (February 23, 2015). Will the Causes of Falling Real Interest Rates Unwind? Interest rates around the high-income countries of the world have been dropping for two decades. Why? Will the pattern reverse itself? interest rate," published in December 2015 as Bank of England Working Paper #571. "Reflecting the experience of the so-called ‘two lost decades’, Japanese sovereign yields have been low throughout the period, edging down from around 2% in 1997 to zero today. 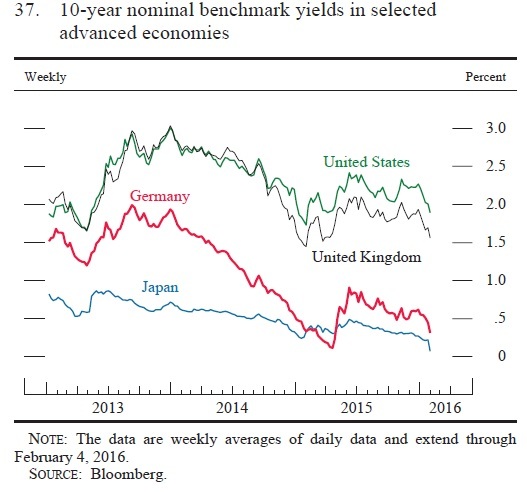 The downward trend is more marked for the other three jurisdictions, with yields starting at around 6-7% and falling to around 2% for the US and UK and to near zero for Germany. It is particularly notable that the financial crisis and subsequent Great Recession registers as little more than a minor blip on this downward trend; other forces have evidently been at work." Notice that the decline in interest rates is global, which suggests that global economic factors are the driving force rather than national-level economic factors or policy decisions. In addition, inflation has been mostly low and not changing much during this time, so this decline in nominal interest rates isn't a result of lower inflation. Indeed, the same pattern of declining interest rates appears in government-issued bonds that are indexed to the rate of inflation, like the Treasury inflation-protected securities in the US or the "indexed gilts" in the UK. Thus, the analytical task is to offer some reasons why real interest rates for risk-free assets might have fallen by about 4 percentage points over roughly the last two decades. Interest rates are of course just a price for borrowing or lending money, and for economists the natural reasons for a lower price are that demand fell or supply rose--or some combination. In markets for loanable funds, a greater supply could emerge from a higher rate of saving, while a lower demand could result from a drop in the propensity to invest. In addition, there could be specific factors affecting supply and demand for low-risk "safe" assets, like Treasury bonds. The authors of both reports converge on a similar set of explanations, although their emphasis is a little different. 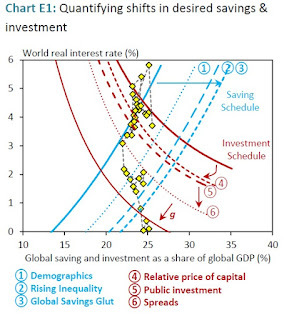 Our analysis suggests the desired savings schedule has shifted out materially due to demographic forces (90bps of the fall in real rates), higher inequality within countries (45bps) and a preference shift towards higher saving by emerging market governments following the Asian crisis (25bps). 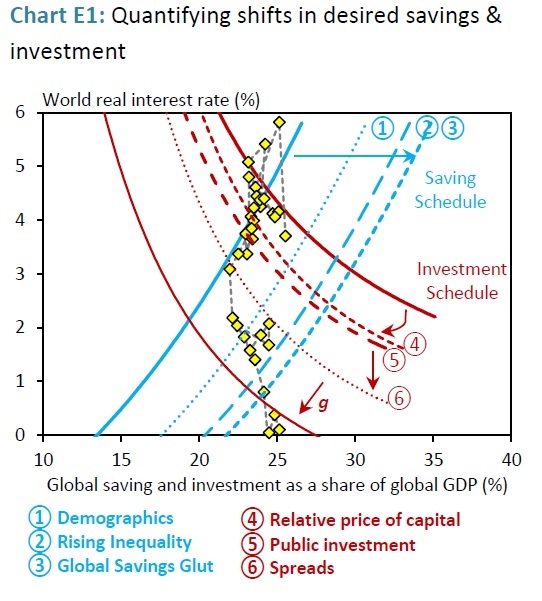 In addition, desired investment rates appear to have fallen as a result of the decline in the relative price of capital goods (accounting for 50bps of the fall in real rates), a preference shift away from public investment projects (20bps), and an increase in the spread between the risk free rate and the return on capital (70bps). ... This savings-investment framework provides a broad description of the relative sizes of the different forces at play. The confidence interval around such estimates is clearly very wide, but taken at face value, shifts in preferences appear to explain around 300bps of the decline in real rates since the 1980s, on top of the 100bps explained by the deterioration in the outlook for trend growth. • Demographic pressure associated with increased longevity and lower fertility is likely to have been important, especially during the first half of the period. The surge in Chinese savings is likely to be a particular reflection of these demographic forces. But these pressures are likely to wane in coming years, as the population share of the high-saving middle-aged relative to that of dissaving retirees is presently around its peak. • The gradual integration of China into global financial markets may have also placed downward pressure on the global real interest rate. The pattern of capital flowing ‘uphill’ from emerging to advanced economies is consistent with this explanation. • While a decline in the propensity to invest seems less convincing as an explanation of the pre-crisis downward trend in real interest rates, it does seem likely to have played a role in explaining developments since 2008. • Shifts in the supply of, and demand for, safe assets may also have placed downward pressure on the risk-free real rate, particularly since the financial crisis. This is consistent with the rise in equity risk premia in recent years, though some of the other evidence is less supportive. There are several reasons why it is reasonable to expect the natural real rate of interest to rebound in the future. force depressing aggregate savings propensities over the next few decades. • The headwinds following the crisis should ease if the recovery strengthens. Firms are likely to become less cautious about investing as uncertainty recedes. And even if the growth in investment opportunities is curtailed in the advanced economies for the reasons cited by the advocates of secular stagnation, there should surely still be plenty of investment opportunities overseas in the emerging and developing world. Balance-sheet repair should also become less pressing for highly indebted households as income growth picks up. • The portfolio shift towards safe assets could also start to unwind. China is no longer accumulating US Treasuries in the way it did before the crisis. And the preference for safe assets may also begin to lessen as uncertainty recedes and the appetite for risk returns. In contrast, when Rachel and Smith look at the factors driving low interest rates, they argue: "We expect most of these forces to persist and some may even build further." 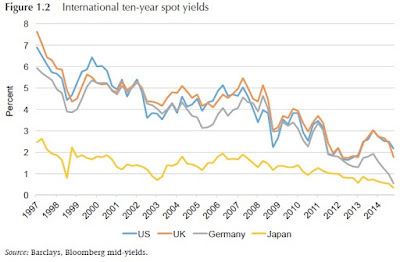 The very low level of long-term risk-free real interest rates in the advanced economies is historically most unusual. Real rates have rarely been so low; when they have been, it has almost invariably been during or after a war, when there was a degree of financial repression and/or inflation was elevated. The present configuration of low real rates with low inflation appears to be unprecedented. The Greek scientist and philosopher Archimedes is reputed to have said: "Give me a lever and a place to stand, and I will move the world." Well, the World Bank doesn't have a long enough lever. Total outstanding World Bank loans are $152 billion. If one could magically take that $152 billion and distribute it outright to the 2.1 billion people who live on less than $3.10 per day, it works out to about $72 per person--which is a month or so of consumption even for these very poor people. If it is only the returns from World Bank loans are spread among those 2.1 billion people (an assumption that can be questioned), the gains to consumption would last longer, but also be much smaller. There's not much prospect that World Bank funding will increase dramatically. So how can the bank choose a place to stand, so that it can leverage its resources as much as possible? Two papers in the Winter 2016 issue of the Journal of Economic Perspectives tackle this problem: Michael A. Clemens and Michael Kremer discuss "The New Role for the World Bank", while Martin Ravallion explores "The World Bank: Why It Is Still Needed and Why It Still Disappoints." Both papers, in related but different ways, argue that the World Bank needs to shift its focus. The original idea of the World Bank at its founding back in 1944, in the aftermath of World War II, was that global capital markets were not very functional, and that in particular low-income countries were unlikely to have the access they needed to investment capital from high-income countries. Whatever the merits of that argument in the 1940s and 1950s, it doesn't hold up so well in the 21st century. The last quarter century has seen dramatic rises in international foreign direct investment, foreign portfolio investment, and in remittances that emigrants send back to their home countries. 5 percent of the aggregate private capital flows to developing countries. Also, it's become fairly common to hear that certain low-income countries have borrowed so much that repayment of that debt has become a burden hindering their growth--which is pretty much the opposite of not being able to borrow. In short, the idea of the World Bank as a major player in global capital markets for low-income countries no longer fits with the facts of the world economy. Indeed, Clemens and Kremer detail an estimate that if you just look at how of a subsidy the World Bank is offering low-income countries (which includes loans made at below-market interest rates and outright grants), "total subsidy provided by the World Bank Group’s shareholders to clients overall is in the range of $11.0–14.2 billion per year." The alternative vision offered by the JEP articles is that the World Bank should use its loan and grant programs so that it has legitimacy as a player in development issues, but that the real leverage of the World Bank isn't from the money. Instead, the Bank's leverage, its place to stand, is to focus on policies for reducing extreme poverty (rather than being broadly concerned with helping economic growth) and with being a knowledgeable and trusted source of advice on what works. But here the problem arises in thinking about the World Bank as a trusted source of knowledge about how to help the poor. In the post-modern 21st century, we are often quick view ideas like "knowledge" and "trust" as little more than pretty language designed to fool the suckers for long enough to impose a desired politics and ideology. It can be hard to work one's way around to a mature view that even though knowledge is almost never truly dispassionate or disconnected from politics, knowledge is still real and possible. Or to recognize that while trust should only be given conditionally and incrementally in matters of public policy and finance, trust can lead to working relationships that are far more smooth and productive than the perpetual embrace of mistrust. The first question we would surely ask of a knowledge bank is whether it establishes a sound prior case for its own interventions and systematically assesses whether that case turned out to be valid. The World Bank has not, however, lived up to this ideal. Evaluation is generally weak and unbalanced, both before and after implementation. This reflects a lack of focus on the welfare outcomes of projects and policies. Instead of studying the effect on its stated goal of poverty reduction, the focus tends to be on monitoring inputs—for example, schools built rather than education attainments ... The Bank was once a leader in cost–benefit analysis, but this is no longer true. While the Bank’s operational directives call for cost–benefit analysis, it is not implemented for most Bank projects (World Bank 2010). The proportion of projects quoting an expected rate of return has fallen over time. Cost–benefit analysis has clearly fallen out of favor among World Bank staff and managers. From the beginning, the World Bank had a political mission—to use aid to keep countries in the Western political orbit and to compete with the USSR for economic and political influence in third world countries—as well as a narrower economic mission. The political nature of the institution has continued. In particular, the United States has effective veto power over major Bank decisions, and Bank lending tends to follow the commercial and financial interests of the United States. Indeed, US officials explicitly demanded such behavior in recently declassified documents from long ago. Also, countries temporarily on the UN Security Council receive more Bank loans, and Bank projects may be used to reward countries for General Assembly votes that support priorities of the United States and other high-income countries. The United States has successfully intervened to limit Bank lending to some countries, including Iran. Ravallion's paper offers a detailed blueprint for how the World Bank might reshape itself from being a "lending bank" to a "knowledge bank," including its practices concerning loan-granting and evaluation, gathering and dissemination of data and research findings, policy advice, and other dimensions. Perhaps counterintuitively, if the US thinks that it's useful to have a World Bank that is viewed as knowledgeable and trusted, and not (primarily) politically motivated, then the US needs to loosen its grip on the bank. For example, the tradition that only a US citizen can be president of the Bank needs to end, and voting power in the governance of the Bank needs to be adjusted over time so that the emerging economies of the world have have bigger say. Health. The World Bank promoted a shift in budgets away from tertiary-care hospitals in capital cities towards community health centers and rural clinics providing basic primary care—for example through Ethiopia’s Health Extension Program and Brazil’s Family Health Extension Program. Health budgets are now substantially more oriented toward primary care. At one point the Bank pushed for charging fees to at least certain categories of patients, although it has now backed away from this. It now frequently promotes the adoption of pay-for-performance programs within government health services. Education. The number of out-of-school children and adolescents worldwide fell from 196 million to 124 million between 2000 and 2013 despite population growth over the period. The Bank has been an important part of the movement for universal primary education, and now that the vast majority of primary-school-age children in the developing world are enrolled in school, the Bank is shifting its focus to improving learning. Social protection. The Bank has played an important role in the spread of “conditional cash transfer programs”—in which cash transfers to low-income households are linked to children attending school or seeing health care providers. After promising results from Mexico’s PROGRESA in the 1990s (now referred to as Oportunidades) and Brazil’s Bolsa Alimentação program, the Bank now supports conditional cash transfer programs in 26 countries. The Bank both financially supported national programs and vigorously promoted conditional cash transfer programs, including at international conferences convened for that purpose in Mexico in 2002, Brazil in 2004, and Turkey in 2006. The Bank’s researchers also played an important role in rigorously evaluating the impact of these programs, a factor in their rapid diffusion. Such programs have been found to reduce poverty and improve child health and education. Regulatory policy. The World Bank’s Doing Business reports, which provide objective and internationally comparable measures of how different countries regulate the private sector, have been very influential in motivating countries to reduce regulatory barriers to establishing new firms. Tax policy. While the International Monetary Fund has played a bigger role, the World Bank has supported the dramatic worldwide shift to value-added taxes, which have replaced other taxes widely considered less efficient. Since 1960, a VAT has been adopted as the main consumption tax in over 140 countries. Trade policy. The World Bank, along with the IMF, has supported shifts from rigid import quotas to more flexible tariffs, along with reductions in tariffs and movements toward “unified” exchange rates in which the same exchange rates are applied to all types of trade. From the 1980s to 1990s, most World Bank adjustment operations were made conditional on trade liberalization. Tariffs and statutory barriers to business creation have declined dramatically. In India, for example, the weighted tariff rate has fallen from 54 to 7 percent between 1990 and 2009. Conflict recovery. In post-conflict situations, the Bank has supported community-driven development programs and procedures for demobilizing and providing transitional support to ex-combatants, for example, in Bosnia, Cambodia, El Salvador, Lebanon, and Uganda. Property rights. Since the 1960s, the Bank has supported land demarcation and titling programs in Armenia, Bolivia, Guatemala, Indonesia, Malawi, and elsewhere across the developing world. Thailand used World Bank support to partition and distribute land to rural residents. Whereas governments of developing countries once regularly appropriated private assets, they are now more likely to privatize state assets. Few of us will be in total agreement with any list like this one. My point is that one's feeling about the World Bank as a knowledge bank and a poverty-fighting institution will depend in substantial part on whether you think this kind of list is mostly right or mostly wrong. Clemens and Kremer sum up their own views this way: "Indeed, we do not agree with all of these policies or believe they were all well implemented, but we do agree with the general thrust of most of them and believe that they reflect mainstream views within the economics profession." The popular saying that "demography is destiny" is of course not literally true. Economic factors like demography set the stage, but actions still affect outcomes. As Stephen Hawking wrote in his 1993 book: "I have noticed that even people who claim everything is predetermined and that we can do nothing to change it, look before they cross the road." That said, demographic patterns can greatly affect the economy. The Council of Economic Advisers has published the 2016 Economic Report of the President, which I commend to readers who would like a nice overview of the state of the US and world economy along many dimension. In the next week or so, I'll put up some posts on a few aspects of the report that jumped out at me. One such discussion was about the global workforce and patterns of global aging. 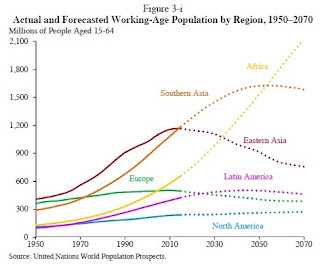 The report shows the number of people in the working-age population in different regions of the world, both going back to 1950 and then projecting forward to 2070. "Over the next 30 years, half of the world’s population will live in Africa and Southern Asia; global population growth will be driven by their high fertility and relatively young populations. As a result, the bulk of new workers in the global economy will be added in economies that have lower levels of education, technology, and capital, implying those workers will not be as productive, if current circumstances continue. 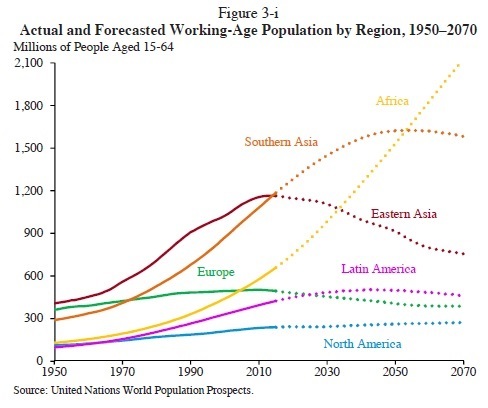 By 2035, the number of people joining the working-age population from Sub-Saharan Africa and Southern Asia will exceed that from the rest of the world combined. This means both South Asia and Africa will be increasingly important to global growth." These shifts in the workforce will be accompanied by shifts in the "dependency ratio," which is calculated by adding the the number of people 14 and under to the number who are 65 and older, and then dividing that total by the size of the working age population. 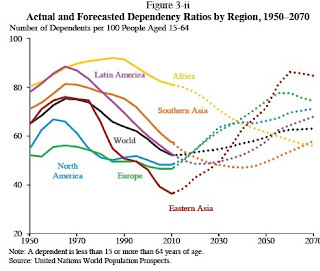 Most areas of the world have seen a fall in the dependency ratio from, say about 1960 or 1970 up to the present. 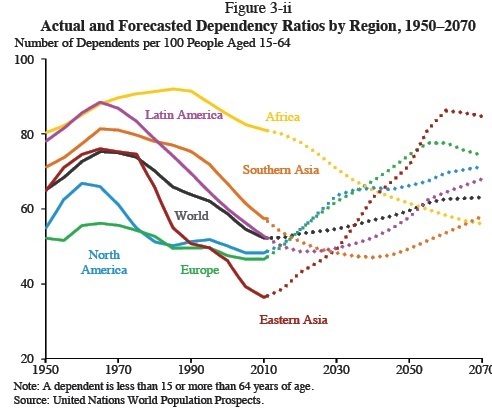 But in most areas of the world--Africa with its rapid workforce growth excepted--are now headed for a sharp rise in the dependency ratio in the dccades ahead. "Global demographic trends are at a turning point. Population growth is slowing and, after increasing for the previous five decades, the proportion of the population that is working-age peaked at 66 percent in 2012. This proportion is projected to decline steadily for the next century. This slower growth in the working-age population—or outright contraction—will continue to be a drain on global growth for the foreseeable future. ... Demographic changes also indirectly affect the amount of resources per capita through changes in household savings behavior across their life cycles. Lower dependency ratios (the ratio of people younger than 15 or older than 64 to the working-age population) can raise savings, which helps finance more investments and increases output. Finally, demographics indirectly affect productivity growth through changes in the quality of human capital formation and innovation. Nevertheless, the reverse is also true. Demographic changes can act as a drag on economic growth. In thinking about the relationship between population, working-age population, dependency ratios, and economic growth, it's going to become more important over time to divide economic statistics by various relevant population measures. Doing this can sometimes lead to unexpected conclusions. For example, the report offers a US-Japan comparison. We all know that Japan's real GDP growth in the last 25 years has been disappointingly sluggish, right? 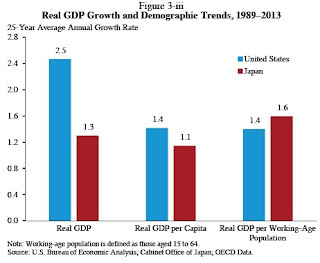 The first two bars show that real annual GDP growth in the US has been roughly double that of Japan. But if you look at growth in real GDP per capita, you are then taking into account that Japan's population growth has been very slow--indeed, Japan's total population peaked back around 2008 and has been declining since. Thus when you look at growth of per capita GDP, the US lead over Japan is greatly reduced, as shown by the second set of bars. Now consider the working-age population in Japan, which peaked back around 1995 at about 87 million, and now has declined to about 77 million. If you look at annual growth of real GDP growth per working age population, Japan's proverbially sluggish economy has actually exceeded the US rate. "The social indicators presented in this chapter illustrate in broad terms how the Nation is faring in selected areas in which the Federal Government has significant responsibilities. Indicators are drawn from six selected domains: economic, demographic and civic, socioeconomic, health, security and safety, and environment and energy. ... In choosing indicators for these tables, priority was given to measures that are broadly relevant to Americans and consistently available over an extended period. Such indicators provide a current snapshot while also making it easier to draw comparisons and establish trends." This section includes a long table stretching over parts of three pages shows many statistics for ten-year intervals since 1960, and also the last few years. For me, tables like this offer a grounding in basic facts and patterns. Here, I'll offer a bunch of comparisons drawn from the table over the last half-century or so, from 1960 or 1970 up to the most recent data. Real GDP per person has roughly tripled since 1960, rising from $17,198 in 1960 to $50,777 in 2015 (as measured in constant 2009 dollars). Inflation has reduced the buying power of the dollar over time such that $1 in 2014 had about the same buying power as 12.5 cents back in 1960, according to the Consumer Price Index. The employment/population ratio rose from 56.1% in 1960 to 64.4% by 2000, then dropped to 58.5% in 2012, before rebounding a bit to 59.3% in 2015. The share of the population receiving Social Security disabled worker benefits was 0.9% in 1960 and 5.9% in 2015. The real stock of fixed assets and consumer durable goods has more than quadrupled in the last half-century, rising from $11.2 trillion in 1960 to $52.9 trillion in 2014 (as measured in real 2009 dollars). The net national savings rate was 10.3% of GDP in 1960, 7.2% in 1980, and 5.8% in 2000. It actually was slightly negative at -0.9 in 2010, but was back to 3.1% in 2015. Research and development spending has barely budged over time: it was 2.52% of GDP in 1960 and 2.72% of GDP in 2013, and hasn't varied much in between. Average family size was 3.7 people in 1960, and 3.1 people in 2015. Single parent households were 4.4% of households in 1960, and 9.3% of all households in 2012, but slightly down to 8.8% of all households in 2015. The share of 25-34 year-olds who are high school graduates was 58.1% in 1960, 84.2% in 1980, and 89/1% in 2014. The share of 25-34 year-olds who are college graduates was 11% in 1960, 27.5% in 2000, and 33.5% in 2014. The average math achievement score for a 17 year-old on the National Assessment of Educational Progress was 304 in 1970, and 306 in 2012. The average reading achievement score for a 17 year-old was 285 in 1970 and 287 in 2012. The murder rate was 5.1 per 100,000 people in 1960, rose to 10.2 per 100,000 by 1980, but had fallen back to 4.5 per 100,000 in 2014. Life expectancy at birth was 69.7 years in 1960, and 78.8 years in 2014. Infant mortality was 26 per 1,000 births in 1960, and 5.8 per 1,000 births in 2014. In 1960, 13.3% of the population age 20-74 was obese (as measured by having a Body Mass Index above 30). In 2013, 38.6% of the population was obese. In 1970, 37.1% of those age 18 and older were cigarette smokers. By 2014, this has fallen by half to 17%. Total national health expenditures were 5.0% of GDP in 1960, and 17.5% of GDP in 2014. Highway fatalities rose from 37,000 in 1960 to 51,000 in 1980, and since then are down to 33,000 in 2014. Energy consumption per capita was 250 million BTUs in 1960, rose to 350 million BTUs per person in 2000, but since then has fallen to 309 BTUs per person in 2014..
Energy consumption per dollar of real GDP (measured in constant 2009 dollars) was 14,500 BTUs in 1960 vs. 6,200 in 2014. Electricity net generation tripled from 4.2kWh per capita in 1960 to 12.8 kWh per capita in 2014. The share of electricity generation from renewable sources was 19.7% of the total in 1960, fell to 9.4% by 2000, and had risen to 13.2% of the total in 2014. Numbers and comparisons like these are a substantial part of how a head-in-the-clouds academic like me perceives economic and social reality. If you like this kind of stuff, you would probably also enjoy my post from a couple of weeks back, "The Life of US Workers 100 Years Ago" (February, 5, 2016). By way of contrast, both academics and American policy makers today are increasingly enthusiastic about prizes. The White House urges that “history should be our guide” and “the Federal Government should… use high-risk, high-reward policy tools such as prizes and challenges to solve tough problems.” The federal government has begun to finance prizes as a means of generating new ideas and products, claiming that prizes “have a good track record of spurring innovation.” Numerous businesses have also offered large privately-funded prizes for objectives that range from specific targets to solutions for more general problems. The British Parliament passed a bill in July 1714 “for providing a public reward for such person or persons as shall discover the longitude at sea.” The bill offered “10,000 pounds if the method were accurate to within 1 degree, or 60 nautical miles; 15,000 pounds if the method were accurate to within 2/3 degree, or 40 nautical miles; 20,000 pounds if the method were accurate to within ½ degree, or 30 nautical miles.” The panel of judges comprised 22 commissioners, including the astronomer royal, the Speaker of the House of Commons, and the lords of Admiralty. A poor clockmaker named John Harrison eventually came up with a solution, but the Longitude Board was too busy fighting among its members over the prize money. Indeed, it never actually awarded the prize, although Harrison got a partial reward 47 years later from another source. Perhaps even more to the point, there had been prizes offered for a solution to the longitude problem for centuries by Spain, Venice, Holland, and others--and all those prizes had failed. Other famous historical examples of prizes turn out to be unsatisfactory in various ways, as well. "[T]he French Academy of Sciences in 1775 offered a cash prize for the discovery of a process to create sodium carbonate from the cheaper sodium chloride. Nicolas Leblanc succeeded in finding a viable manufacturing solution, but he never received the prize and his factory was expropriated by the revolutionary government." In other cases, a prize was offered and awarded, but the inventor made vastly more money out of patenting and selling the invention over time. Thus, it's not at all clear that the very small additional incentive provided by the prize was important. This theme applies, for example, to when Hippolyte Mège won a prize from Napoleon III for making margarine production commercially viable, and when John Wesley Hyatt won a prize offered by the billiard table producers Phelan and Collender in 1863 for a method of making billiard balls out of something other than ivory. A policy related to prizes is to buy out the inventor's patent. A classic historical example here is when the French government in 1839 bought the rights from Louis Daguerre for his daguerrotype photographic process. Inconveniently, Khan points out that Daguerre never had a patent. Instead, he used powerful patrons to lobby with the French government for a payment, on the grounds that getting a patent was too expensive and difficult, and if the French didn't pay him for the invention, some other country would. As soon as the French paid him, he then applied for a patent in England, and tried to sell the rights to the British government--who refused to bite. Khan also considers at some length the series of 18th- and 19th-century institutions in various European countries that offered prizes for inventions, including France's Société d'Encouragement pour l'Industrie Nationale (Society to Encourage National Industry or SEIN) founded in 1801, England's Royal Society for the Encouragement of Arts, Manufactures and Commerce (commonly known as the Royal Society of Arts or the RSA) founded in 1754. In any event, history indicates that the evolution of the institution of innovation prizes over the past three centuries serves as a cautionary tale rather than as a success story. Thus the inventor of a new machine or | any other invention has the exclusive priviledge of making and vending that invention for the space of 14 years by the law of this country, as a reward for his ingenuity, and it is probable that this is as equall an one as could be fallen upon. For if the legislature should appoint pecuniary rewards for the inventors of new machines, etc., they would hardly ever be so precisely proportiond to the merit of the invention as this is. For here, if the invention be good and such as is profitable to mankind, he will probably make a fortune by it; but if it be of no value he also will reap no benefit. Of course, none of this means that certain kinds of carefully targeted prizes are a bad idea. But it does suggest some reasons that it comes to tools for encouraging innovation, prizes should remain a sideshow rather than taking center stage. 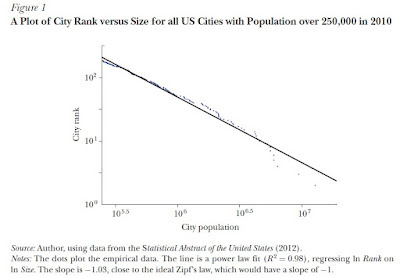 Consider a graph based on the population of US cities, which in this data is all cities with population above more 250,000. The horizontal axis is population, expressed as powers-of-10. 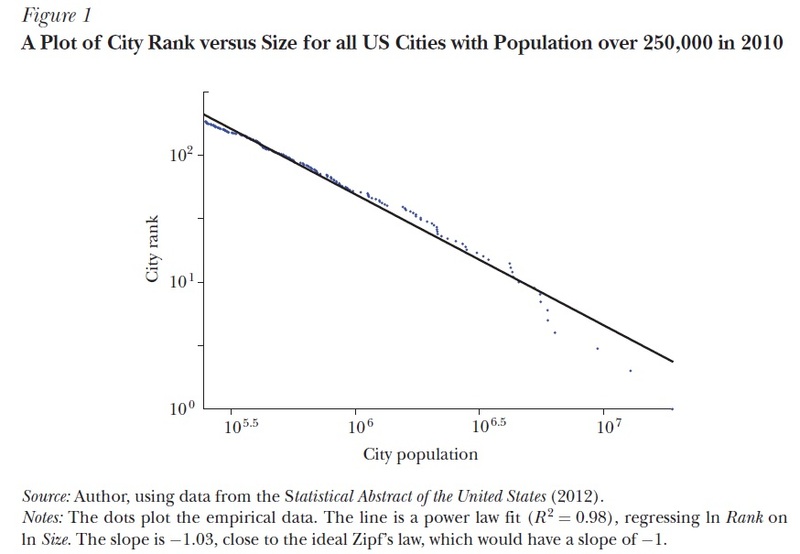 The vertical axis is the rank of the city size--that is cities are ranked by population from #1 New York to #2 Los Angeles and so on. Again, the vertical axis is expressed as powers-of-10. The result is very close to a straight line with a slope of -1. As Gabaix writes: "A slope of approximately 1 has been found repeatedly using data spanning many cities and countries (at least after the Middle Ages, when progress in agriculture and transport could make large densities viable, see Dittmar 2011). There is no obvious reason to expect a power law relationship here, and even less for the slope to be 1." 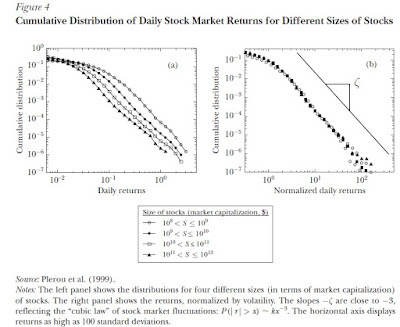 Or here's an example about the distribution of daily stock market market returns. You can read the details of the calculations in the Gabaix article, but again, the axes are expressed as powers-of-10, and a linear relationship seems to emerge. 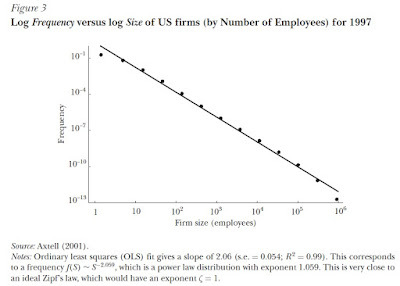 Or here's an example of a power law in the relationship between the pay of CEOs and the size of firms. Here, the labels on the graph are expressed as logarithms. When the size of the firm rises, the so does CEO pay--but in an exponential power-law kind of way. 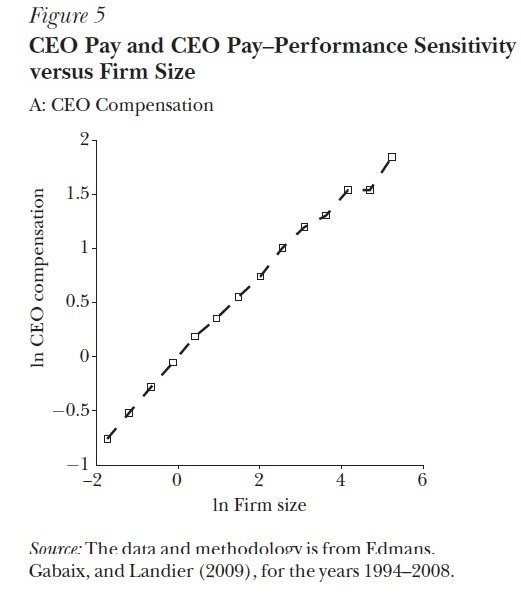 Gabaix writes: "In a given year, the compensation of a CEO is proportional to the size of the firm to the power of 1/3, S(n)1/3, an empirical relationship sometimes called Roberts’ (1956) law." 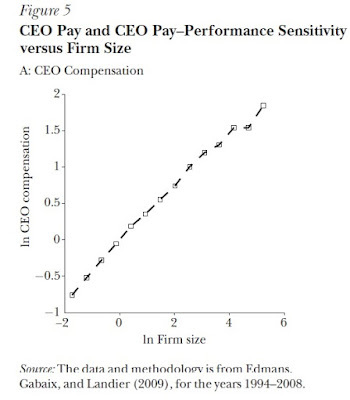 He argues that this pattern of larger firms paying more to their CEOs can explain much the rise in CEO pay over time, as well as cross-differences in what CEOs are paid. Why do these kinds of power law relationships show up so often? Say you start of with a random distribution of something, and the different points in your data all tend to experience proportional growth (positive or negative). However, this particular data (like city size) can't turn negative. In addition, the total size of the system can't grow in an unbounded way. Gabaix explains how with a few additional assumptions this process will result in the kind of straight-line power laws shown here. Of course, this kind of explanation then needs to be adapted and applied to each specific situation. 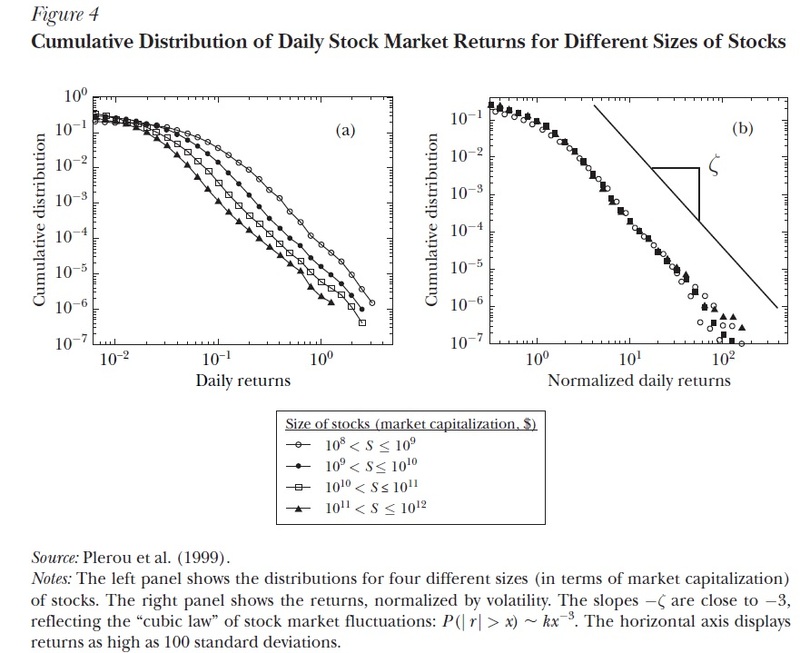 Want a power law outside of economics? 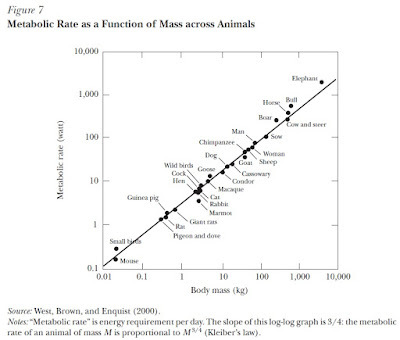 Here's a graph where the typical mass of an animal is shown on the horizontal axis with a power-of-10 scale, and the metabolic rate, or energy requirement of that animal each day, is shown on the vertical axis. I'm sure that clever biologists can give reasons for why this should be so. 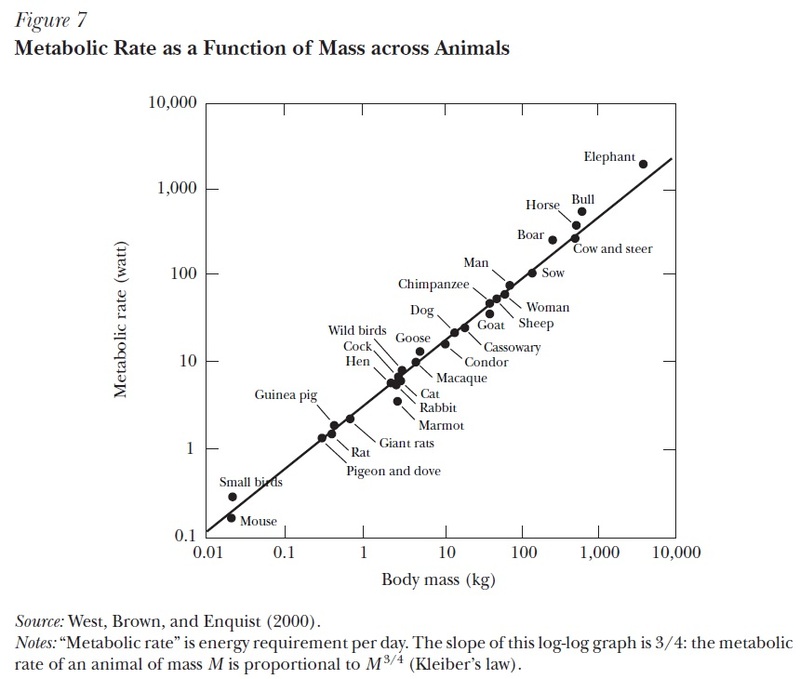 But given what certainly seem to be substantial differences in animal behavior, it's not obvious to me that, before the data was available, they would have expected straight-line power-law to emerge here, either. Twice each year, the Federal Reserve is required to submit to Congress a report about "the conduct of monetary policy and economic developments and prospects for the future." The most recent Monetary Policy Report went to Congress on February 10, 2016. A number of the themes will be familiar to regular readers of this blog. For example, there's a discussion of how US unemployment rates have more-or-less bottomed out, and whether there are some signs of a pickup in wage growth (see my post on "Unemployment is Bottoming Out, So What's Next?" January 25, 2016). There's a discussion of how the inflation rate is affected by fluctuations in energy prices, food prices (see "Breaking Down US Inflation Rates by Category," February 9, 2016). There's a discussion of how Federal Reserve policy of raising interest rates may not have a huge effect on emerging markets, because any negative effects they experience from capital outflows will be largely offset by how a lower exchange rate spurs their exports ("Bernanke on the Fed, the US Dollar, and the Global Economy," January 8, 2016). Here, I'll just note a couple of other figures that caught my eye. 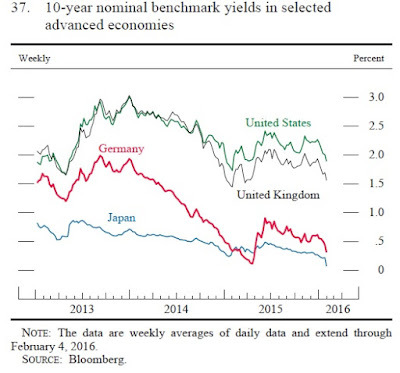 A divergence has emerged in the interest rates of advanced market economies, between the US and UK on one hand and the euro-zone and Japan on the other. Here are a couple of examples. The first shows nominal yields on 10-year government debt. The other is what's called the "overnight index swap rate." In general, an interest rate "swaps" contract occurs when one party that's getting a variable interest rates over time swaps with another party that is getting a fixed interest rate over time. Obviously, the fixed interest rate in the swap will reveal what the average of the variable rate is expected to be. 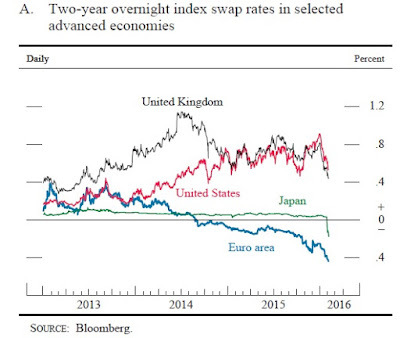 The figure shows the two-year overnight index swap rate for several economies. For the US, this is the fixed interest rate which shows what the average value of the US federal fund interest rate (the interest rate targeted by the Federal Reserve) is expected to be in the next two years. The other lines show what average interest rate is expected for the target interest rate of other central banks--and notice that it is turning negative for the Bank of Japan and the European Central Bank. 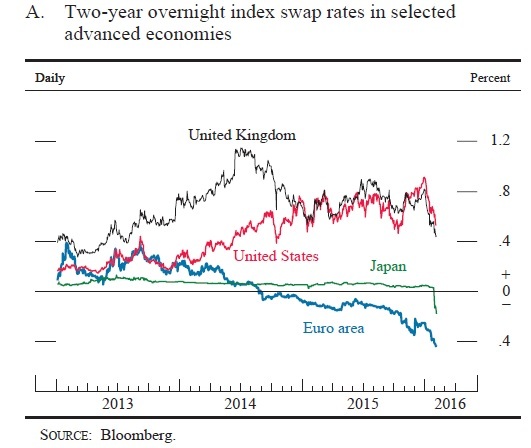 Both sets of interest rates show that the rates for the US and the UK are substantially above those for Japan and the euro-zone. The reasons for such a divergence are a jumble of expectations about growth rates, inflation rates, financial stability, and central bank policies. But whatever the reasons, this difference helps to explain why demand for US dollar assets is up and the US dollar exchange rate has been rising. The big shift in the Federal Reserve balance sheet has leveled off. Just about anyone who is teaching a serious course about Federal Reserve Policy in recent years uses some version of this figure. It shows the assets and liabilities of the Federal Reserve system. For example, two of the main assets of the Fed are the US Treasury securities that is owns, along with the mortgage-backed securities and housing-related debt that it owns. The "other assets" are mainly certain premiums or discounts on these two other categories that for one accounting reason or another aren't built into the usual price of the asset. The two main liabilities of the Fed are currency--that is, Federal Reserve notes in circulation--along with the deposits it holds from member banks. The remaining "Capital and other liabilities" includes, for example, the US Treasury General Account, which is more-or-less the checking account through which the federal government pays its bills, and also includes some financial deals like reverse repurchase agreements. The figure shows how the Fed balance sheet has evolves over time. Back in mid-2007, Fed assets were basically all Treasury securities, and its liabilities were basically all currency. But when the financial crisis hit in late 2007, several shifts happened. The Fed set up an alphabet soup of agencies to make temporary loans to various financial institutions during the recession: for example, the Primary Dealer Credit Facility, the Asset-Backed Commercial Paper Money Market Mutual Fund Liquidity Facility, the Commercial Paper Funding Facility, and the Term Asset-Backed Securities Loan Facility. On the asset side, you can see how these loans blossomed for a time, then were repaid after the crisis, and these temporary agencies have now been shut down. Almost no one talks about these temporary agencies any more, but they were a rapid and innovative success in helping to prevent financial contagion from spreading. As the temporary lending facilities phased out, you can see the quantitative easing policies come into play. The Fed started investing directly in mortgage-backed securities. It greatly increased its investments in US Treasury debt. On the liability side, banks began to hold much larger reserves at the Fed than the bare legal minimum they used to hold. The banks now receive interest on these reserve, too. These changes leveled out in the later part of 2014. But clearly, the Fed as a financial institution has been fundamentally changed from those not-so-long-ago days when it was pretty much all about US Treasury securities and currency. The "gig economy" essentially refers to workers who are available when someone wants to hire them, but who don't have any long-term guarantee of how many hours they will work or in some cases even how much they will earn. Those who work for temp agencies are part of the gig economy, and so are those who drive for a company like Uber. But one problem overhangs all discussions of the gig economy. The discussions often end up being about anecdotal cases, either of those who find the gig economy to be a useful and preferred arrangement, or others who feel pressured into the gig economy because they couldn't find a steadier ongoing job. There's not broad agreement on how to define the gig economy, and partly as a result, there also isn't good systematic evidence on how many workers are in the gig economy or how those workers perceive their jobs. The Secretary of the US Department of Labor, Thomas Perez, announced a couple of weeks ago that the DoL would be working with the US Census Bureau to add as set of survey questions about "contingent workers" to the May 2017 Current Population Survey. But while we're waiting for that survey to happen, and the results to be tabulated and released, what do we know now? "The size of the contingent workforce can range from less than 5 percent to more than a third of the total employed labor force, depending on the definition of contingent work and the data source. ... However, no clear consensus exists among labor experts as to whether contingent workers should include independent contractors, self-employed workers, and standard part-time workers, since many of these workers may have long-term employment stability. There is more agreement that workers who lack job security and those with work schedules that are variable, unpredictable, or both—such as agency temps, direct-hire temps, on-call workers, and day laborers—should be included. We refer to this group as the “core contingent” workforce. We estimate that this core contingent workforce comprised about 7.9 percent of employed workers in the 2010 GSS [General Social Survey] and also made up similar proportions of employed respondents in the roughly comparable 2005 CWS [Contingent Worker Survey] and 2006 GSS—5.6 percent and 7.1 percent, respectively." The data surveyed by the GAO suggests that the contingent workers tend to be younger and less educated, with about a 15% chance of leaving the labor force or being unemployed one month later. Even after adjusting for other observable factors that affect wages (like experience and education), contingent workers earn about 10% less per hour. They are less likely to have benefits, and less likely to be satisfied with their jobs overall. But notice that the definition of a "contingent worker" in this GAO study is not especially new. Job categories like "agency temps, direct-hire temps, on-call workers, and day laborers" have been around for awhile. The evidence they cite is only updated through 2010. Somehow, these categories and teh timing of the data don't quite seem to cover what it means to work for a company like Uber. By informal work we refer to any income-generating activity that does not involve a contract between an employer and an employee (except possibly for contracts involving a single task). This definition includes activities that monetize possessions (such as selling used goods or renting out one’s property) as well as activities that monetize free time and skills (such as babysitting). Typical features of informal work are the following: (1) it involves a greater degree of scheduling freedom than a formal job would, (2) the worker is paid on a per-service or per-good basis, and (3) the work does not provide benefits such as health insurance or pension contributions. ... The number and types of paid informal work opportunities have expanded in recent years, in no small part due to the appearance of new technologies facilitating the so-called peer-to-peer economy. 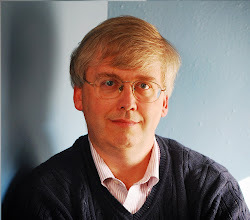 Well-known peer-to-peer businesses include Uber, a taxicab-like business that connects drivers with riders via mobile phones; Airbnb, which enables individuals to rent out their home for brief stays; Amazon Mechanical Turk, which offers the opportunity to do basic computing work from home on a fee-for-service basis; and Taskrabbit, which facilitates spot contracting for personal services." "In Survey 2 [the January 2015 survey], the share of survey-takers who reported participating in informal paid work increased significantly—from 40 percent to 52 percent among men and from 40 percent to 60 percent among women. Among both women and men, participation rates became more equal across education classes in Survey 2. Among women, this equalization reflected in part a large increase in participation among those with high school or less, while among men, the equalization embedded a large increase in participation among those with a graduate degree. At the same time, however, informal participation increased between the surveys among highly educated and highly paid men, an outcome that likely reflects the fact that recent technological innovations have expanded the set of informal work opportunities and made it easier to engage in such work. Indeed, among both men and women and in both surveys, more than half of those who report engaging in informal work are performing internet-based tasks. In addition, one of the categories with the highest increase in participation between surveys was “online tasks,” which refers to activities such as rating pictures or copy-editing online. Female informal work participants in Survey 2 were more likely than those in Survey 1 to report both that informal earnings were their main source of income and that informal work helped at least somewhat to offset recent negative employment shocks. Taken together, our results suggest that some individuals continue to seek out informal work in order to offset negative economic shocks, while others engage in informal work—despite already being fairly well off—because it offers an easy way to earn extra cash. They slice up the data in a number of ways, based on whether people have other full-time jobs, other part-time jobs, or no other jobs, as well as by education level. But as an overall summary, it's fair to say that men in the informal economy in this survey were working 10-15 hours per week and earning about $240 per month. Women in the informal economy in this survey were working in the range of 8-18 hours per month at these jobs, and earning in the range of $135-$185 per month. The most common activity for both men and women was "selling online." These results are quite heterogenous: those working in the informal sector include high-educated people who have full-time jobs, low-educated people without a job, and everyone in between. There's reason to believe that these kinds of informal jobs are going to increase in number. The Boston Fed researchers also point to some estimates by PricewaterhouseCoopers, who back in 2014 made predictions about sales growth in five "sharing economy" sectors, "peer-to-peer finance, online staffing, peer-to-peer accommodation, car sharing and music and video streaming. PwC estimates that these five sectors had $15 billion in sales in 2013, but are headed for $335 billion in sales by 2025. The gig economy is the collection of markets that match providers to consumers on a gig (or job) basis in support of on-demand commerce. In the basic model, gig workers enter into formal agreements with on-demand companies to provide services to the company’s clients. Prospective clients request services through an Internet-based technological platform or smartphone application that allows them to search for providers or to specify jobs. Providers (i.e., gig workers) engaged by the on-demand company provide the requested services and are compensated for the jobs. Business models vary across companies that control tech-platforms and their associated brands. Some companies allow providers to set prices or select the jobs that they take on (or both), whereas others maintain control over price-setting and assignment decisions. Some operate in local markets (e.g., select cities) while others serve a global client base. Although driver services (e.g., Lyft, Uber) and personal and household services (e.g., TaskRabbit, Handy) are perhaps best known, the gig economy operates in many sectors, including business services (e.g., Freelancer, Upwork), delivery services (e.g., Instacart, Postmates), and medical care (e.g., Heal, Pager). However, gig jobs may differ from traditional freelance jobs in a few ways. The established store-front and brand built by the tech-platform company reduces entry costs for providers and may bring in groups of workers with different demographic, skill, and career characteristics. Because gig workers do not need to invest in establishing a company and marketing to a consumer base, operating costs may be lower and allow workers’ participation to be more transitory in the gig market (i.e., they have greater flexibility around the number of hours worked and scheduling). But while this definition of the gig economy is nice and specific, the report then runs into the problem that there is no systematic survey evidence on the "gig economy" defined in this way. As one example, the number of what the Census Bureau calls "Nonemployer Establishments," which are firms that don't employ anyone but earn at least $1,000 in a year and pay income tax, seems to be on the rise. 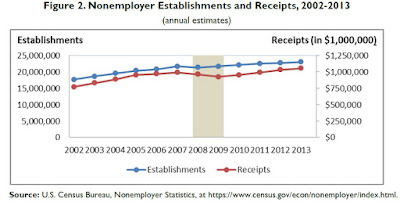 But it is not at all clear what share of this increase is the "gig economy" as narrowly defined, or those in the "informal economy" or in the category of "contingent workers." There's considerable discussion over whether the rise of the gig economy, or the informal economy more generally, represents a broad shift in the conditions of the labor force that should push us to broader labor market reforms about issues involving minimum wages, overtime pay, unemployment insurance, or other benefits for these kinds of workers. I discussed one such proposal in "New Rules for the Gig Economy?" (December 9, 2015). The problem at this stage is that it isn't yet clear, even roughly, how many workers are facing what kinds of problems. Full-time workers picking up some extra income in the gig economy are one thing. Part-time workers or those without other jobs who are earning most of their income in the gig economy pose other issues. With a broad array of new labor force relationships, it's very hard to sort out the costs and benefits of different set of rules--especially given the ability of on-demand firms and workers to alter their labor force relationships in response to any new rules that are enacted. Whenever the US economy looks shaky, one of the most common questions I hear is whether this recovery has "run its course" or "gotten old." The downturn of the US economy during the Great Recession ended back in June 2009, so it's now been about 80 months of an economy on an (often frustratingly slow) upswing. There's a basic statistical answer to this question, but there's also a broader issue that tackles of how to think about a "business cycle." When looking at the path of economies over time, you see recessions and recoveries. But there also a well-known is a common cognitive pattern of "paraedolia," which refers to looking at randomness and perceiving patterns that aren't really there. Even using the conventional term "business cycle" for patterns of recession and recovery hints at a belief that the economy is be based on underlying patterns and dynamics that will cause it to rotate in a preordained way from recovery to recession and back again. When people ask whether the recovery is "getting old" or has has gone on "long enough," they are presuming this kind of "cycle." The statistical answer to whether economic upswings die of old age can be answered statistically, and Glenn D. Rudebusch summarizes the conventional wisdom very nicely in "Will the Economic Recovery Die of Old Age?" written as the Federal Reserve Bank of San Francisco "Economic Letter" for February 8, 2016. Rudebucsh uses a kind of graph called "survival analysis," which can be applied to people's chance of dying, to part of a machine wearing out or breaking, to whether economies fall into recession, and many other applications. As an example, here's a survival curve for the probability of an American male dying in the next year, The graph shows that the chance of dying in the next year doesn't rise very much at all for men up to the age of about 50 or 60, but then it starts to rise steadily with age. A survival curve for the economy asks a question like: "What's the chance of an economic recovery ending in the next month?" Based on data for US business cycles going back to 1858, the patterns look quite different for before and after World War II. Here's Rudebusch's figure. Before World War II, there was a substantial rise in the chance of recession as an expansion aged: that is, after about four years, the chance of a recession int he next month has reached 20% and climbing. But since World War II, the chance of a recession rises by comparatively little as a recession ages: it's maybe 2% chance of recession in the next month after four years, but still only a 4% chance of recession in the next months after 10 years. In short, US business cycles in the last 70 years or so don't seem to have a natural lifespan. However, the notion of predictable cycles was once very hot stuff in the economics profession. One classic exposition is the great economist Joseph Schumpeter's 1939 book on Business Cycles (an abbreviated version is available on-line here). Schumpeter suggested that the rise and fall of the economy could be understood through a mixture of three different kinds of cycles: short-run, medium-run, and long-run. The short-term 3-5 year cycles were called Kitchin cycles, and Joseph Kitchin argued in 1923 that they were based on variations in of psychological factors and crop yields. (If you want more, see Joseph Kitchen, "Cycles and Trends in Economic Factors," Review of Economics and Statistics, January 1923, 5:1, pp. 10-16.) The medium-run Juglar cycles were based on fluctuations in levels of fixed investment often stemming from waves of innovation, as first argued in an 1869 book by by Clément Juglar (a condensed English translation is available here). The long-run Kondratieff cycles happened every 50 years or so, give or take a decade or two, and were based on major technological shifts (an English translation of Nikolai Kondratieff's 1922 article is available here). For example, Schumpeter suggests in his 1939 book that a Kondratieff cycle had run from the start of the Industrial Revolution in the 1780s up through 1842, when it was followed by what he called "the age of steam and steel" from 1842 and 1897, and then age of "electricity, chemistry, and motors" after about 1898. But as Schumpeter was quick to note, the idea of three overlapping cycles wasn't meant to be definitive. He wrote: "There are no particular virtues in the choice made of just three classes of cycles. Five would perhaps be better, although, after some experimenting, the writer came to the conclusion that the improvement in the picture would not warrant the increase in cumbersomeness." For the modern economist, this notion of maybe three or maybe five overlapping cycles, happening over maybe 3-5 or 7-11 or 40-60 years, sounds a lot like an attempt to impose an overall template pattern that isn't really there on an essentially random set of events. Sure, one can look back after the fact and analyze the proximate causes of recessions, like the Federal Reserve raising interest rates to fight inflation in the early 1980s, or the aftermath of the dot-com investment boom in the later 1990s, or the housing price bubble leading up to the Great Recession. But those proximate causes were not an inevitable cycle; instead, they were the result of other economic events and policy choices. So the good news is that the US economy doesn't seem to be doomed by any mechanical law of aging recoveries to enter a recession soon. After all, there was a period between recessions in the 1960s that lasted 106 months and the another period between recessions from the 1990s into the early 2000s that lasted 120 months. But on the other side, the US economic recovery is far from bulletproof, and remains vulnerable to twists of policy and fate.